This slide show includes a year of variations of a weekend chat or talk for Spanish class. 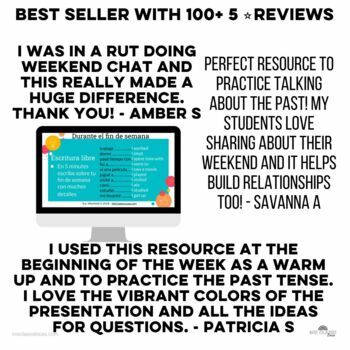 It is a great way to start class on Monday or after a break that personalizes content to your students. It focuses on the preterit tense talking about specific events of the weekend. 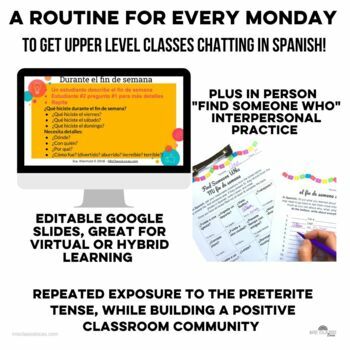 It could be adapted for all levels including Spanish I, Spanish II, Spanish III and Spanish IV as a classroom management routine class starter, or brain break. The slide show includes 26 slides in a PDF, with a link to a Google Slide show in the instructions page. Each slide has a a prompt in Spanish for students to do at the start of class Monday. 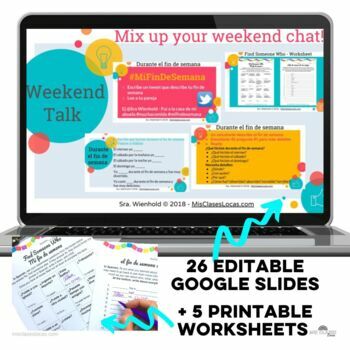 This resource also includes the differentiated Find Someone Who weekend talk resource. Variations of this people hunt could be printed and used as an option as well. Please do not purchase if you already own Find Someone Who - Weekend Talk as it is included. This resource is a part of the following Bundle Para Empezar: 1 Year of Spanish Bell Ringers/ Brain Breaks #2. 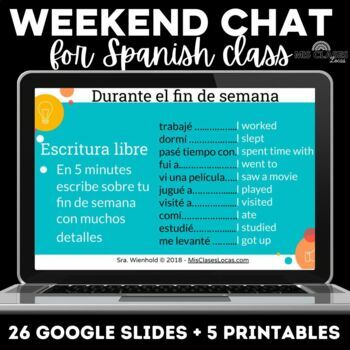 •Para Empezar: 1 Year of Weekend Chat for Spanish class. •Para Empezar: 1 Year of martes del mapa. •Para Empezar: Música miércoles - 1 full year of music for Spanish class. •Para Empezar: Jaja jueves - 1 full year of funny bell ringers or brain breaks. •Para Empezar: Baile viernes - 1 full year of dance for Spanish class. •Para Empezar for the Novice Spanish. •Hispanic Heritage Month: Song of the day - 1 from each country!. •Para Empezar - Day of the Dead. •6 Weeks of Exploratory Spanish Para Empezar. •Para Empezar - Winter Holidays. •Para Empezar - Valentine's Day. •7 Weeks of Para Empezar. •Music Bracket for Spanish Class. •6 Weeks of Intermediate Spanish Para Empezar. For more information, check out my blog Mis Clases Locas! Mis Clases Locas - Para Empezar .